Another entry in our series of successful Grossmont and Cuyamaca college graduates. Mary Sessom was already a practicing attorney when she decided to take a class in child development at Cuyamaca College. She stuck with the program, earning her associate’s degree in 1992 and gaining knowledge that has made her a better lawyer, parent – and now a grandmother. Sessom, who specialized in family law and was frequently involved in litigating child custody issues, said her knowledge of child development made it easier for her to talk to child psychologists and make a better argument during court proceedings. In addition to her work as an attorney, Sessom has had a deep commitment to serving her community. Since 1996, she has served as the mayor of Lemon Grove, a city with about 25,000 residents in eastern San Diego County. She also served as PTA president at her children’s school, and was a founder of the Lemon Grove Educational Foundation, the school district’s fundraising organization. She continues to participate in community events such as the Relay for Life and the Lemon Grove Historical Society. Grossmont College hosts "A Photographer's Journey on the Border"
Paul Turounet, an associate professor at Grossmont College, spent a decade photographing the migrant experience from the Mexico side of the border. He will discuss his photographs and personal experiences from 2 to 3:15 p.m. May 2 in Building 26, Room 220 on the Grossmont College campus. “Viewers are invited to reflect on the anxiety and uncertainty of the migrants, and contemplate that emotional place we all must face when we leave behind the known for the unknown,” said Turounet, chair of the college’s Visual Arts and Humanities Department. “Under The Green Moon: A Photographer’s Journey on the Border” is free and open to the public. The perfect combination of music and cars is in store Saturday, May 4, at Cuyamaca College, where a lively competition for high-school automotive students in the morning will be followed by an afternoon of live bands and entertainment at the Coyote Music Festival. Starting at 8:30 a.m. and ending with an awards presentation at 1 p.m., about 70 auto-tech students from high schools throughout the county will gather at the Rancho San Diego college for the 34th annual Auto Skills Day, one of the oldest events at the campus, second only to graduation. Another college tradition, also open to the public, is the fifth Annual Coyote Music Festival, which this year is promising more than just the usual eclectic mix of live blues, rock, pop, folk, indie, and alternative rock. Students signing up for summer session classes at Grossmont and Cuyamaca colleges have more than three times the number of sections to choose from compared to last year, thanks to voters who passed a statewide tax measure last fall increasing education funding. With more than 250 sections to select from at the two East County colleges compared to just 74 last summer, students will have greater certainty of getting the classes they need to graduate, transfer to a university or to make career advances. However, the fuller summer schedule is still a long way from the college district’s offerings of nearly 700 summer course sections in 2008, before state budget cuts whittled down the summer program. Registration begins April 29 for the six- and eight-week classes starting June 10. November’s passage of the statewide tax measure, Proposition 30, prevented further catastrophic budget cuts to education and allowed the colleges to increase their course offerings. Between 2008 and 2012, state funding to the Grossmont-Cuyamaca Community College District was slashed by $16 million, requiring the two colleges to eliminate 1,600 classes. Thousands of students were placed on waiting lists and unable to obtain the courses they needed for their education. Summer classes are a great way for students to enroll in hard-to-get prerequisite classes like Principles of Biology or Intermediate Algebra or those quick to fill in the fall, including Astronomy. Many students also appreciate the luxury of focusing on one course, instead of several courses during a semester. Both colleges are offering several sections of general education classes in history, biology, chemistry, sociology, math, music and psychology. Grossmont College is also offering a wide range of specialized classes: administration of justice courses in criminal law; a culinary arts class in pastry skills in chocolate preparation, a business office technology course in effective job searching; and a selection of health professions classes, including those in nursing, occupational therapy assistant, orthopedic technology and cardiovascular technology. At Cuyamaca College, students can enroll in career-technical education classes in automotive technology, computer and information science, environmental health and safety, and ornamental horticulture. Students can register by going to WebAdvisor on the college websites, www.grossmont.edu and www.cuyamaca.edu , where summer class schedules are posted. Classes cost $46 per credit unit. An award winning short-story writer and an Iraqi poet will headline Grossmont College’s Literary Arts Festival April 29 through May 2. Tobias Wolff, a Stanford professor, won The Story Prize in 2008 for his collection of short stories, “Our Story Begins.” He has published several novels and memoirs, and his work regularly appears in magazines and literary journals, including “The New Yorker,” “The Atlantic” and “Harper’s.” Wolff will read and sign his books from 7 to 9 p.m. on Wednesday, May 1. Are you worried about the effect that text messaging is having on the salience of language? Well, why should you be any different than Socrates? The ancient Greek philosopher also worried about what another revolution in communications -- that of writing -- would have on Greek thought and intellect. Radio commentator Martha Barnette recently shared this and other examples of humanity resisting technological achievement in a symposium with students, faculty and guests at Grossmont College. The hostess of PBS' popular radio show, "A Way With Words," said that another example of this phenomenon was the fear expressed by the philosopher Friedrich Nietzsche that the invention of the typewriter might result in a diminution of the written world. Tweeting and texting may be our current worry, Barnette said during the April 18 on-campus session, but she predicted that, before long, current day tweeters and texters will be fretting about some even-newer advance in communications. Barnette admonished her audience not to fear changes, but to engage these changes critically. She urged that they become sophisticated consumers of whatever technology, media and language the future may hold. practices CPR on a mannequin. With East County as home to the second-highest Iraqi population in the United States, Cuyamaca College and the county of San Diego have partnered on a pilot program to address the basic health needs of recent immigrants. Project SHINE (Students Helping in the Naturalization of Elders) is a six-month program that offers classes in English As a Second Language with a focus on health literacy. The goal of the free El Cajon classes is to help recent refugees become more self-sufficient by teaching them practical English and lessons in basic health so they can make doctor’s appointments and be able to explain their medical needs. While open to all refugees and immigrants who have lived in the United States for five years or less, the classes are held at four sites near El Cajon’s downtown core to target the more than 11,500 Iraqi refugees who have moved to the area since 2007. A faculty-choreographed dance concert will showcase the Grossmont College program’s diverse instruction, including salsa, tap, ballet, contemporary, modern and hip-hop. “Entrances & Exits” is scheduled for 7:30 p.m. April 25, 26 and 27 at the Joan B. Kroc Theatre, 6611 University Ave., in San Diego. Admission is $10, pre-sale; $13 at the door – cash only. Seven faculty members choreographed the concert and Grossmont students will be dancing to classical and contemporary music, swing from the 1930s, a Gershwin classic and a Lyle Lovett tune. The Grossmont-Cuyamaca Community College District and Grossmont College were honored Thursday with five PRO Awards from the Community College Public Relations Organization in recognition of exemplary marketing, communications, design and public relations efforts. CCPRO is a statewide professional development and service organization that seeks to promote excellence in California's community college public relations and related professions. The college district’s awards included those recognizing its efforts to inform the public about Proposition V, Grossmont-Cuyamaca’s $398 million construction bond measure approved by East County voters in November, and Proposition 30, the statewide tax measure for education funding, which also won in the fall election. The Grossmont music department’s fundraiser April 21 features pop and jazz standards from a talented group of musicians who teach at the college. Ken Anderson, vocals and piano, is an internationally-recognized gospel musician. He’s also the music director of the Martin Luther King Jr. Community Choir. Fred Benedetti began playing guitar at age 9 and in 1986, was chosen as one of 12 guitarists worldwide to perform in the master class of Andres Segovia at the University of Southern California. He’s performed all over the world, including with opera tenor Luciano Pavarotti and jazz artist Dave Brubeck. Doug Booth, guitar and bass, was 15 when he was chosen to play with the Santa Clara Honor Jazz Band and a year later with the California All State Jazz Band. He currently performs with “Rockola” locally and internationally. Melonie Grinnell, vocals and piano, has performed at Dizzy’s and Croce’s Jazz Bar. She has been the pit keyboardist for Starlight Civic Theater, the San Diego Repertory Theater and the Lawrence Welk Theater. 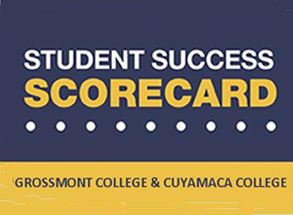 The Student Success Scorecard released last week by the California Community Colleges Chancellor’s Office provides a new tool to clearly and concisely measure student performance at the state’s 112 community colleges, making the system one of the most transparent and accountable in the nation. The scorecard enables colleges to have clear data regarding student success by race, ethnicity, gender and age to help the institutions focus on helping all students succeed in their classes and stay in college. Students, parents, community leaders and policy makers can use the scorecard to track the rate of students completing certificates and degrees and transferring to four-year universities. Fifteen retired Grossmont and Cuyamaca College professors were awarded emeritus status at the Grossmont-Cuyamaca Community College District Governing Board meeting April 16. Emeritus status is given to retired faculty members who have served in the district for at least 20 years and have the rank of professor. The emeritus professors represent 435 years of service to Grossmont and Cuyamaca colleges. Here's a listing of the faculty and a brief description of their service. Congratulations to all of them! You may know what LOL means, but what about AFAIK or SALU2? You can be sure Martha Barnette, co-host of the public-radio show, “A Way with Words,” knows. Barnette, who began her radio career in 2004, promises laughs along with learning at a Grossmont College event from 2 to 3:15 p.m. Thursday, April 18, in Building 26, Room 220. The event is free and open to the public. Barnette worked as a reporter for the Washington Post and an editorial writer for the Louisville Courier-Journal before beginning her career in radio. She is a graduate of Vassar College with an A.B. in English, and she did graduate work in classical languages at the University of Kentucky. She also studied Spanish in Costa Rica. With farmer’s markets, community gardens and urban farming growing ever popular among the health- and conservation-minded in East County, it’s no wonder the Spring Garden Festival at Cuyamaca College has become such a major draw. This year’s festival on Saturday, April 27, marks the 20th anniversary of the event, which began in 1993 as the Urban Forest Field Day, an outreach activity for arboriculture students to demonstrate what they’ve learned. From one course and a few visitors, the free festival has grown to become a showcase event for the college’s entire ornamental horticulture program, as well as the Heritage of the Americas Museum and the co-sponsoring Water Conservation Garden, both located on the Rancho San Diego campus. With the addition of local artisans, vendors, kid-friendly activities, and a variety of plant and garden societies, the festival now attracts about 7,000 visitors annually. Admission, parking and Old Town Trolley transports between the activity sites are free for the 9 a.m.-4 p.m. event. Student Esau Cortez credits Grossmont College with changing his life, but he is the one making an impact in student government. Cortez was chosen as the 2013 Young Luminary during the second annual San Diego Latino Champion Awards Ceremony, sponsored by U-T San Diego. “I want to thank Grossmont for helping me become someone I didn’t know I could be,” said Cortez, 19, of Santee. Carlos Contreras, Ph.D., a history professor at Grossmont College was one of four finalists for the 2013 Teacher of the Year award at the Latino Champions event held recently at SeaWorld. Juan Mora of Serra High School was the award winner.